I was doing podcasts before podcasts were cool--like two solid years before Serial. SO TAKE THAT SARAH KOENIG!!!! Over the next few weeks, I am going to be re-posting some of my old interviews so that they can be accessed by anyone who might find them useful. It's also an opportunity for me to take a stroll down memory lane. I took a break from the podcasting thing last year for a variety of reasons, most related to the significant time commitment. To be sure, I don't miss the hours and hours spent editing and streamlining interviews. But I do miss the conversations with interesting people. 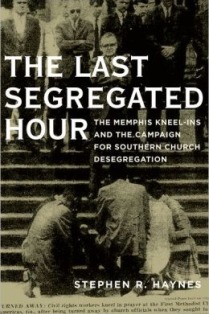 Stephen was my first interview for the Marginalia Review of Books and we discussed his book, The Last Segregated Hour: The Memphis Kneel-Ins and the Campaign for Southern Church Desegregation. We actually recorded this at the 2013 meeting of the American Academy of Religion, so it was one of the few face-to-face interviews that I did. Here's the interview, followed by the opening paragraphs of my review of the book. I plan to add all of these to my new "Podcasts" page for easy access and cataloging. In the introduction of The Last Segregated Hour, Stephen Haynes mentions the Walgreens in his Memphis neighborhood. In 1960, civil rights protesters were arrested there, and store managers soon removed their lunch counter instead of integrating it. Today, any memory of this store’s contested history has all but faded away. In contrast, Haynes insists that longtime residents of Memphis who glance at Second Presbyterian Church (SPC) instantly recall biracial groups protesting the church’s segregation policy in the mid-1960s. Similarly, many still sardonically refer to Independent Presbyterian Church (IPC) as “First Segregationist.” “Clearly,” the author resolves, “the moral standing of churches in this and other communities makes it difficult for people to forget, let alone excuse, what they perceive as immoral behavior on the part of church representatives." With this comparison, Haynes vividly outlines his book’s contribution to the history and historiography of civil rights. Church protests—or “kneel-ins”—were small in number across the South. But these prayerful petitions left indelible marks on the region’s physical, social, and religious landscape. Alas, Haynes laments that historians have given scarce attention to this topic. His book begins to fill this gap by using the Memphis kneel-ins of 1964–1965 as a point of departure for investigating the protests and their legacy. . . .